I seriously can not believe it is June 1st! May just flew by, as is 2018! It's definitely been a busy past month. Anyhow, thanks for stopping by today! Glad you are here. Did you check out Barb's creation? Hope you are feeling better Barb. Our new Stampin' Up! 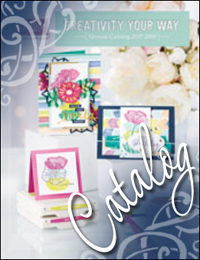 Annual Catalog kicks off today and there so great new items in it! 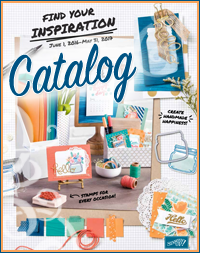 This year Stampin' Up! is celebrating 30 years! Happy 30th Stampin' Up! I myself, will be celebrating eight years of being a demonstrator. 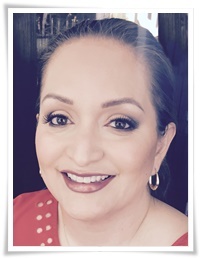 Still love it and am so happy to be a part of a great company. For my creations, I'm featuring the stamp set Accented Blooms, which also coordinates with the Tailored Tag Punch. I decided to keep my creations simple and focus on stamps, ink and paper, after all, that's what first attracted me to Stampin' Up! Love how everything coordinates, which makes it easier for me. I embossed the background in white embossing powder. I'm also showcasing the new 2018-2020 InColors. I also used the new InColor 6x6 DSP, which is the perfect size for cards. Sometimes simple doesn't have to be boring, not with such beautiful colors. This is Call Me Clover. Up next is Connie! Can't wait to see what she has in store for us! Fantastic job Kathya!! I haven't bought this stamp yet...but now it is on my list for sure! Hugs!! What a lovely way to display the new In-Colors - beautiful!! Thanks Barb, I've definitely been having fun with our new InColors. Awe thanks Di! Fun colors! What a super great way to feature the new colors - really like your card design too. Hope to see you next month!